Storm clouds gathered and thunder rolled during yesterday’s ceremony on the grounds of the Mt. Hood Bed & Breakfast in Parkdale. Talk about electric energy. It was a race against the rain which held off until just moments after pronouncing Eric and Arianna husband and wife. Guests who had traveled from PA, CA, NJ, SD and even Australia, retreated to the banquet barn for a joyful celebration featuring live music and Lebanese cuisine. 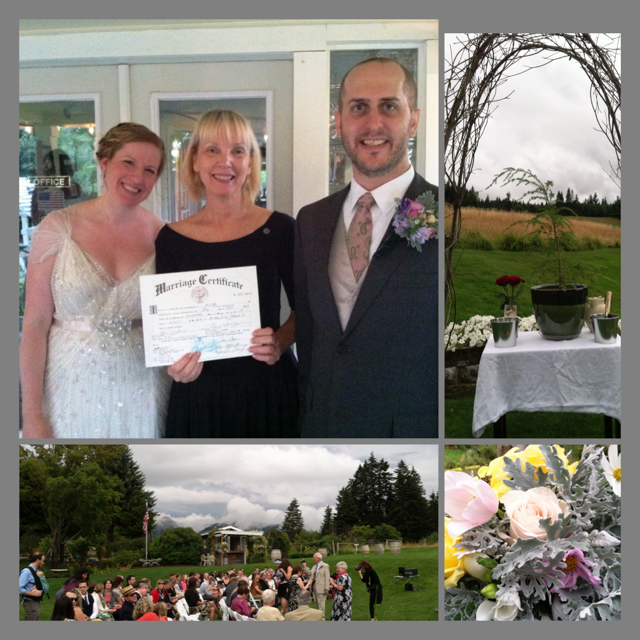 After a honeymoon on the Amalfi coast, the newlyweds return to their home in Southeast PDX and their careers in nursing and mental health. And they’ll plant the hemlock tree used for their unity ritual during the ceremony. Congratulations, Mr. & Mrs. DiIlio. May your hearts forever hold the love you so beautifully reflected on your wedding day.